We have developed the ASA600012V from the ground up. The efficiency of the whole system is such that correctly installed this boom gate draws less than 1amp. In testing we disconnected the solar panel and let the 7 amp hour battery take full load. After 24 hours and 720 cycles it was still going. 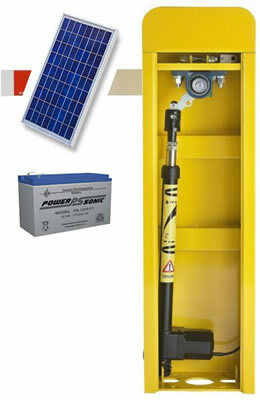 We sell the kit in this form however most customers choose to upgrade batteries and solar panels to allow for other things like safety photocells and access equipment. If you are unsure of what upgrades you may require give your local branch a call to discuss your needs. To see a video on setup and programming of the ASA600012V click here. A handy quick start video.